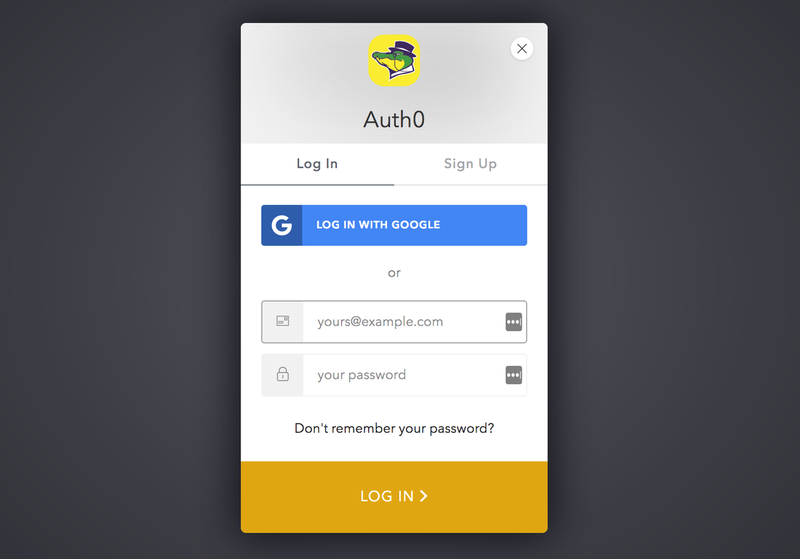 In this post, we’ll be using the Auth0 Lock widget, which allows to embed a popup inside your app for authentication. You can also implement authentication on Auth0’s hosted login page, in which case you may want to refer to this guide. This post covers authentication for Angular 2+ apps. First things first, you’ll need to create an Auth0 account and then create a new Single Page Web Application client. Once your client is created, you’ll be able to configure the settings according to your preferences. One thing that’ll be important is to add a callback URL that reflects an actual login callback route in your Angular app. Here we’ll create a login route, so we’ll add http://localhost:4200/login as our only allowed callback URL. Auth0 will redirect to it after authentication. With Auth0, you can create multiple tenants to accommodate for different deployment environments (development, production, staging,…) Each tenant gets its own domain name (e.g. : my-app-dev.auth0.com and my-app.auth0.com). This way, you can create a different client for production, and all you’d need is to populate your production environment file with the different domain name, client id and callback URL. At this point, you'll want to make sure that your routing module is imported in your app module and that the auth service is provided by the app module as well. We first define a new instance of Auth0Lock, which takes the client id, domain and a configuration object. There are plenty of configuration options available, and here on top of the required options we also added some theming options to style the lock widget. In the options, we also specify what kind of data we want back using the scopes key. Here, on top of the default openid, we’re also interested in getting back the profile information. In the service’s constructor, we listen for either the authenticated or the authorization_error events on the lock instance. The authenticated event’s callback will have our logic for when an authentication is successful. The login method is as easy to implement as calling the show method on our lock instance. We’ll have to come back and finish implementing the logout and and isAuthenticated methods. Let’s complete our auth service implementation. For our example, we’ll save the JSON Web Token that Auth0 returns to local storage. That token can then be added to an Authorization header using the Bearer prefix on HTTP requests to your backend API. It’ll then be the responsibility of the backend to ensure that the token is valid. We’ll also get the account’s profile information that we requested using scopes and save it to local storage. Here we’re calling getUserInfo on the lock instance and passing-in the access token returned from the successful authentication. getUserInfo gives us access to the profile information for the user. Our isAuthenticated method is useful for our app to know if there’s an authenticated used or not and adapt the UI in consequence. 🔑 And there you have it! Simple authentication for your apps.